November 27, 2018 10:55 am. After a troubled second in the Breeders’ Futurity (G1) and a third from post 13 in the Breeders’ Cup Juvenile (G1), Signalman put it together in Saturday’s $200,000 Kentucky Jockey Club (G2) at Churchill Downs. Trained by Ken McPeek and piloted by Brian Hernandez Jr., the 7-2 second choice drew the rail this time and worked out the right trip on the sloppy track. Signalman was reserved in sixth as Topper T led the way through an opening quarter in :23.12, improved his position on the inside at the half in :46.83, and poised to strike just behind the leaders through six furlongs in 1:12.33. Knicks Go, the 3-1 favorite on the strength of his Breeders’ Futurity romp and Breeders’ Cup second, chased early but folded down the lane. King for a Day turned up the pressure on a weakening Topper T and grabbed a brief advantage, but Signalman was now navigating a passage between them. Just as Signalman struck the front, he still raced a bit greenly, and the hard-charging Plus Que Parfait emerged a threat. Signalman kept finding enough to stave him off by a neck in a final time of 1:45.29 for 1 1/16 miles. Limonite, last at one point on the backstretch, rallied to nip King for a Day for third. Slow-starting Roiland advanced to fifth, followed by Tracksmith, Current, Topper T, Dunph, Royal Urn, Knicks Go, Mick’s Star, Blue Steel, and Everfast. Manny Wah and Kentucky Allstar were scratched. The Kentucky Jockey Club awarded Kentucky Derby points to the top four finishers. Signalman’s 10 points for the win, combined with his previous tally of 8, give him a total of 18 and elevate him to third on the leaderboard. Plus Que Parfait (4 points), Limonite (2 points), and King for a Day (1 point) all joined the leaderboard in their first stakes attempt. Campaigned by Tommie M. Lewis, David A. Bersen, and Sherri McPeek’s Magdalena Racing, Signalman sports a mark of 5-2-2-1, $448,990. He was a promising second in his career debut to Sir Truebadour, the eventual Bashford Manor (G3) winner, and broke his maiden next time at Saratoga on the way to the Breeders’ Futurity. Signalman was bred by Monticule in Kentucky and purchased by Ken McPeek, as agent, for a bargain $32,000 as a Fasig-Tipton Kentucky October yearling. 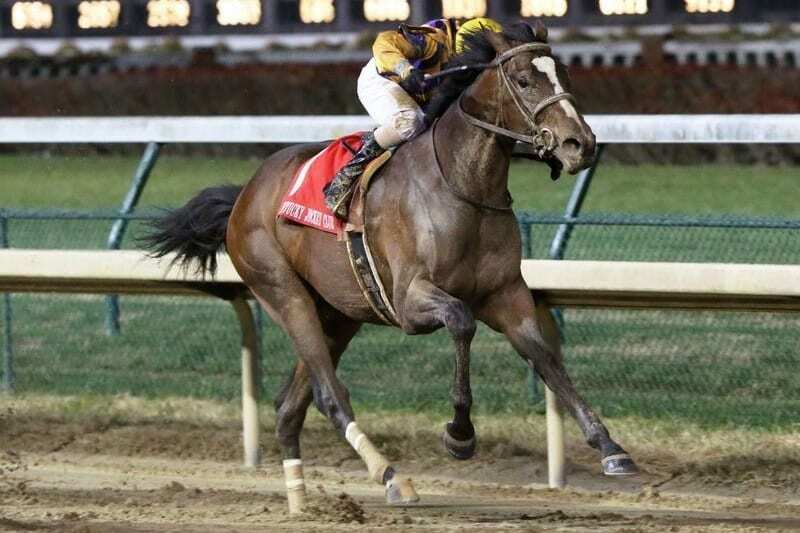 He is by General Quarters, one of the notable stories on the 2009 Derby trail when taking the Blue Grass (G1) for late octogenarian owner/trainer Tom McCarthy, and out of the unraced Trippi mare Trip South.